Android and iOS both offer support for third-party keyboards. And come to think for it, it’s fascinating that you can doc your tablet or smartphone and connect a wireless keyboard to compose a message, write an email or even get some corporate work done. However, not every Android/Windows/iPhone user would be willing to buy an extra accessory just to give it a try. 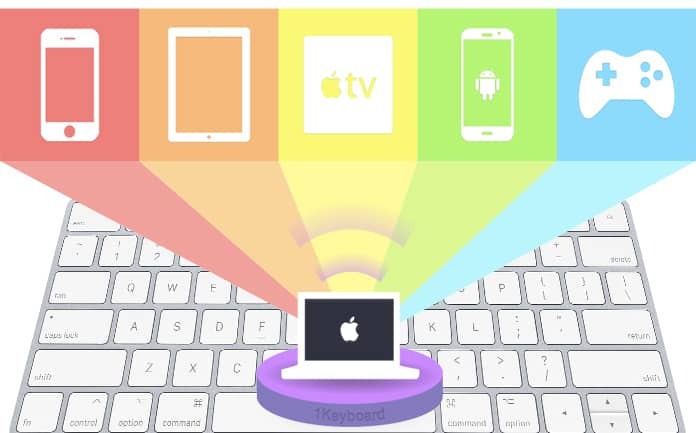 In this article we will teach you how you can use Mac keyboard on iPhone, iPad, PC, Android phone, TV, tablet or any other smart device with Bluetooth. 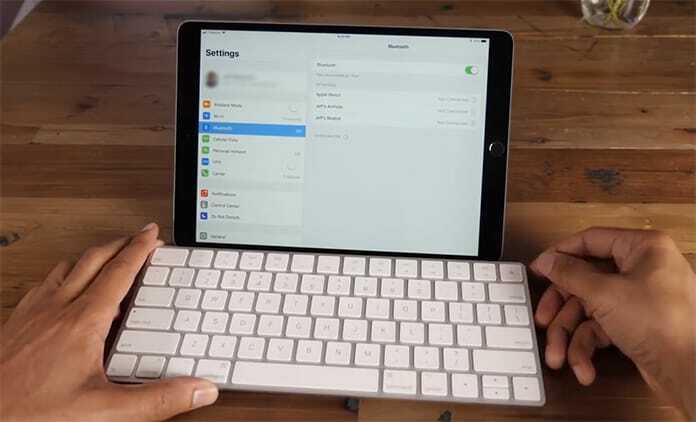 Luckily, if you own a Mac, its keyboard can be used for typing on an iPad, iPhone or any gadget that offers support for third-party keyboards through Bluetooth. For the purpose, you’d need to download 1Keyboard app, a small application that functions on a Mac and lets users type on other devices with support for external keyboard, using the Mac keyboard itself. Configuring 1Keyboard is straightforward. Follow the steps mentioned below to make your Mac keyboard work as an external keyboard for your iPad, iPhone, PC and Android device or any other gadgets. Step 1: Go to the Mac App Store for downloading and installing 1Keyboard app. Step 2: Open the app by visiting the “Applications” folder or with the Launchpad window. You’d see its screen show up in the menu bar of Mac. 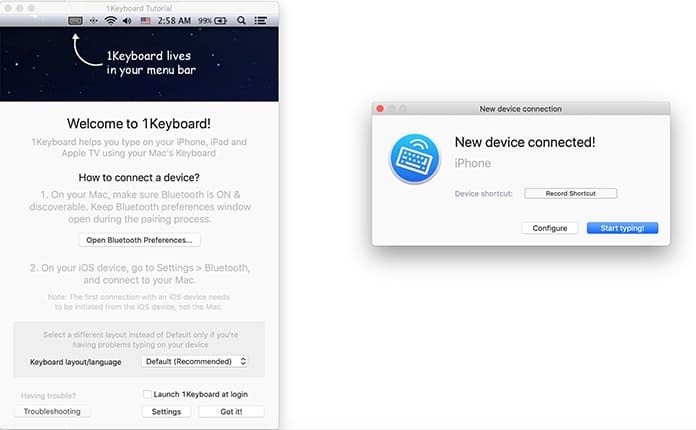 Step 3: On your Mac, launch Bluetooth preferences and pair up the iDevice, Windows PC, Android, or other Bluetooth capable gadget. Ensure all devices have the Bluetooth activated and can be discovered. Step 4: Provide confirmation for the Bluetooth connection, if asked. 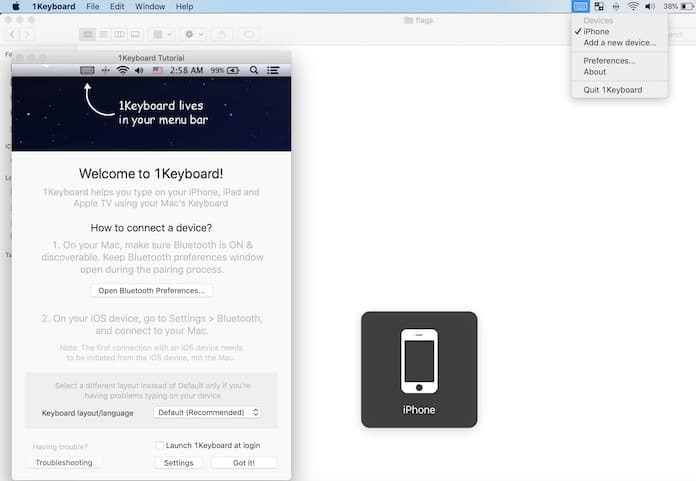 Step 5: Tap on the Menubar icon and select the device you want to use your Mac keyboard and start typing. Once these devices are connected and paired, the app will send a notification that will give off a click sound. That basically tells you that the pairing is complete and you’re all ready to start typing on the paired gadget with the Mac keyboard. Go to this link for more detailed instructions on how a device should be paired with Mac. As a great alternative app to 1Keyboard is Typeeto. You can download it directly from Mac App Store. 1Keyboard was previously available as a free download (the last time we checked) on the App Store for Mac. See if it’s still free and download it to switch your Mac keyboard into a wireless one for iPad, iPhone, PC, Android and other capable devices. Connecting the Apple keyboard with iPad, iPhone, PC or Android device is a really simple procedure. All you need to do is to go to Settings – Bluetooth from the device you want to pair and simply connect to the keyboard. Before you search for a Bluetooth device, make sure that the keyboard is powered on and it’s not paired with another device (unpair if paired). Hope you liked our tutorial on how to use Mac keyboard with iPhone, iPad, Windows PC, Android phone, TV or tablet. Please share this article to the social networks.